These cups use the technique of negative pressure to release rigid soft tissue, drain excess fluid, toxins etc. 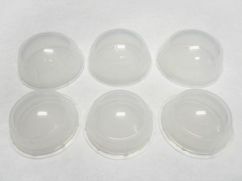 Unlike traditional cupping, rubber cups are made from a soft, flexible rubber and require no firing or pumping. Cups maintain suction over the contours of the body and allow you to control the pressure level. 3 cups with 1.9" inner diameter, 2.6" outer diameter. Thick rubber for increased durability and suction strength. Transparent material allows you to view treatment area. 6 cups per set. Made in China.